Israel's military is training for the possibility the Palestinian Authority may soon launch a formal third intifada. A senior IDF officer warned Thursday morning during an interview on Army Radio that army analysts believe it is likely the PA will choose to launch an intifada over returning to the negotiating table for final status talks with Israel. The officer, who serves in the regions of Judea and Samaria, said Thursday in an interview on Army Radio that soldiers are currently training to deal with four-week confrontation scenarios. The drills are reminiscent of those that were carried out prior to the military exercises held just prior to the PA's launch of the second intifada in 2000. 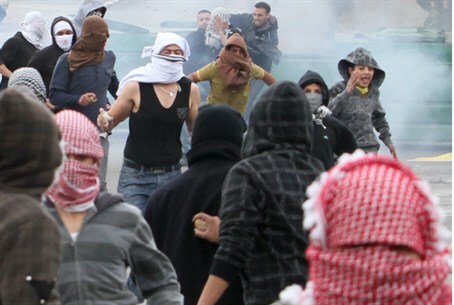 The officer listed a myriad reasons why a third intifada might be ignited in the near future. Among the triggers he noted were the possible failure of U.S. President Barack Obama in his efforts to jump start the peace process during his visit to the region next month, or the possible resignation of Ramallah-based PA Chairman and Fatah leader Mahmoud Abbas. Another possible cause he said would be if the Lebanon-based Hizbullah terrorist organization, or the Gaza-based Hamas terrorist organization, were to declare war on Israel. Both are incited to annihilate Israel, generously funded, equipped and trained by Iran. The second intifada was launched in September 2000 in response to a September 28 tour of the Temple Mount -- Judaism's holiest site -- in the Old City of Jerusalem by then-Opposition leader MK Ariel Sharon, together with a Likud party delegation surrounded by hundreds of Israeli riot police. But although Sharon's tour was deemed to be the trigger, the intifada had long been planned -- in fact, it was set up by PA / PLO Chairman Yasser Arafat months earlier, immediately upon rejecting all offers on the table and walking away from the Camp David peace talks in July. Upon learning the U.S.-based summit would not result in agreement to all his demands, Arafat ordered Hamas, Fatah and the Aqsa Martyrs Brigades, to launch "military operations" against Israel. Former Shin Bet (Israel Security Agency) agent Mosab Hassan Yousef, son of Hamas founder and leader, Sheikh Hassan Yousef several years ago commented in his book, "Son of Hamas" that the second intifada was actually a political maneuver premeditated by Arafat, analyzing the reason to be that Arafat "had grown extraordinarily wealthy as the international symbol of victimhood. He wasn't about to surrender that status and take on the responsibility of actually building a functioning society." Arafat's widow Suha Arafat later confirmed the fact in a December 2012 interview on Dubai television, translated by the Middle East Media Research Institute (MEMRI), that her husband had indeed pre-planned the intifada. More than 1,000 Israelis were killed in terrorist attacks during the years of the second intifada, also known as the Oslo War due to its having resulting from security concessions forced upon Israel during negotiations that resulted in the Oslo Accords. The agreement has been violated thousands of times by the Palestinian Authority -- most recently in its unilateral application and acceptance for membership as a non-member observer nation in the United Nations General Assembly, a status which grants the entity international de facto recognition as an independent sovereign nation -- and thereby circumvents the need for final status talks with Israel.